In a colourful atmosphere full of distinctive fashion wear and souvenirs made from silk, Van Phuc Silk Village has become a tourist village that visitors can hardly skip when they come to Hanoi. About 10 km from the heart of Hanoi, Van Phuc Silk Village lies along the Nhue River. The village is very well-known for the finest and oldest silk in Vietnam. According to ancient books kept to this day, Van Phuc Silk Village was formed more than 1,000 years ago. Despite ups and downs of history, this silk village has increasingly developed and become the most famous silk-weaving village. In the feudal era, it was ordered to make the costume for royal families. Especially, during the Nguyen Dynasty, Van Phuc silk was more and more popular. From Emperor Khai Dinh to Emperor Bao Dai dispatched their servants to buy silk and brocade here. In 1931, Van Phuc silk was first introduced at the Marseille Fair and was regarded by the French as a delicate product of Indochina, which was then exported to Eastern European countries. The village's products have been exported to many other countries around the world since the 1990s. Contemporary architecture prevailed in the village but the overall space still keeps what is typical of Vietnamese rural villages. This can be seen in the layout, architecture, ancient banyan trees, common wells, communal houses and specially techniques of making premium silk. Right on the bank of the Nhue River, visitors can easily see the main gate leading to Van Phuc Silk Village. In spite of being newly built, it is featured with the Vietnamese architectural style typical of red brick, shoe cap-shaped roofing tiles, flying dragons and flying phoenixes. Coming to Van Phuc Silk Village, visitors will see a variety of colourful finest silk and brocades with different patterns like dragon, phoenix, dragon in the cloud, phoenix in the clouds and famous landscapes or simply plain elegant silk. Van Phuc silk is made from silk sourced in Vietnam and most of it is handmade. Thus, it is famous for its durability, quality, softness, lightness, warmth in winter and coolness in summer. Made by skilful hands of workers, every textile is carefully, diligently cared by artisans and adheres to traditional artistry such as symmetrical decoration, simplicity and liberality. In order to make the finest silk, artisans not only have skilful hands but also have rich imagination, knowledge of traditional arts as well as the property of each material to make patterns. In addition, visitors also have the opportunity to explore traditional fabric production processes. Although modern technology has been applied today, traditional silk processes are still very sophisticated, particularly yarn taking, lacquering, weaving, dyeing, stretching and drying. Some old workshops are still found in the village now. 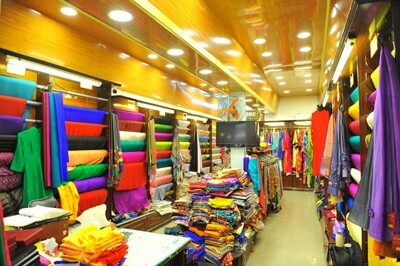 Besides, visitors can easily buy beautiful, top-class handmade silk products such as souvenirs, clothes, towels and handbags. Sellers in Van Phuc Silk Village are very friendly, enthusiastic and many can speak English and French well. Especially, at the village festival, visitors will join many traditional rites and folk games and learn about customs and practices.